Bay Area artist Linda Gass creates art about land use and water issues in California and the American West. She graduated from Stanford University with a BS in Mathematics and MS in Computer Science, and has been creating art for more than 19 years after a decade long career in software. 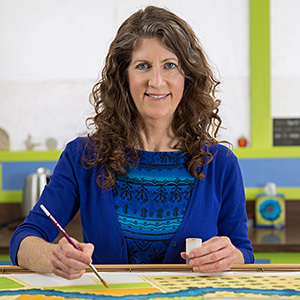 Her work has been exhibited nationally and internationally, and has been published in books and magazines, including 500 Art Quilts, The Map As Art: Contemporary Artists Explore Cartography, and American Craft. Linda's awards include the prestigious Fleishhacker Foundation Eureka Fellowship and the Arts Council Silicon Valley Artist Fellowship. She recently completed a Creative Ecology Art and Science Residency through the Palo Alto Art Center and Junior Museum and Zoo. 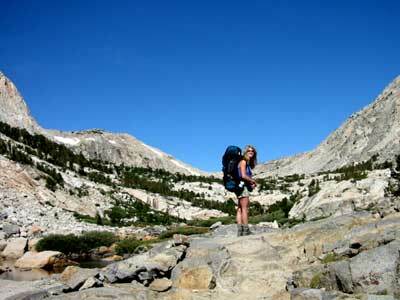 Linda is a native Californian and when she’s not making art or championing environmental causes, you can find her backpacking, camping and hiking in the wilderness areas of the West where she finds much of the inspiration for her work. The artist backpacking in the Sierra coming down from Paiute Pass. Photograph by Will Hirst.